Are your gray hairs driving you crazy? My hair has just started to gray in the past few years and whenever I see one of those curly gray ones curling right over my forehead, it makes me cringe! Do you dye your gray? Touching up gray roots every few weeks is expensive and time consuming, but Gray Away provides women with a secret weapon in their beauty arsenal. Gray Away is easy and convenient and allows women freedom from gray roots in between salon visits. It’s hard enough to make it to the salon every six weeks, let alone every two weeks when your gray roots start to show up again. 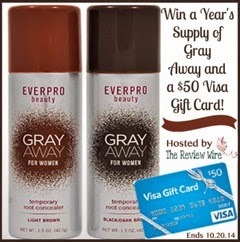 Whether you have limited time or a limited budget Gray Away want's to introduce you to the perfect root touch-up solution – Gray Away by EVERPRO Beauty. We all have our little beauty secrets, and Gray Away should be in every woman’s beauty arsenal. Gray roots start to show only 2 weeks after hair coloring, Gray Away is an easy and convenient way to spray away gray roots instantly. It extends the life of hair color saving both time and money. Gray Away does not contain dyes, it contains mineral derived pigments and it is safe for everyone to use, even pregnant women! Gray Away is a great value ($12.99 for 1.5 oz.) and is available in drugstores nationwide and online. Looking for a delicious way to lose weight? I've just tried these IdealBars and they are scrumptious! Designed as meal replacements, they come in Strawberry Yogurt, Cinnamon Caramel Crunch, Double Chocolate, and Chocolate Peanut Butter. Each IdealBar is packed with 10 grams of protein! They are low in sugar and are only 140 calories. I've tried many "diet bars" over the years but these are so much more delicious. Weight loss CAN taste great! I was honestly very impressed that the IdealBars actually look like the photo of the bars on the box. Most meal replacement bars look kind of sad and beat-up by the time they get to consumers. They also do not fall apart when you take a bite out of them. I tried the IdealBars as a meal replacement for lunch for an entire week. I found that they satisfy my hunger needs for about four hours on average, which is pretty good! My favorite one is the Strawberry Yogurt with the Double Chocolate coming in as a close second. IdealShape has also just released their IdealBoost Raspberry Citrus which are little powder packets that are added to water. They are designed to enhance weight loss and suppress appetite, while boosting energy. I discovered that drinking an IdealBoost mix is a great way to curb my hunger between that 4-6pm period after having the IdealBar for lunch. I really love the Raspberry Citrus taste! I did lose one pound in the week I replaced my lunches with the IdealBars, and most experts agree slow weight loss is better. Check out all the IdealShape products at www.idealshape.com. One of their biggest sellers is their IdealShake, available in Chocolate, Vanilla, and Strawberry. Follow them on Facebook and Twitter, then enter below to win an IdealShape Prize Package! Ready to buy? Here's a special coupon code that will save you 20% off your entire order (one time use only): enter PLANET20 at checkout. Enter to win an IdealShape Prize Package! Prize package for one winner includes: 1 IdealShake mix, Blender Bottle, and 1 box IdealBars (choice of flavor), a $70 retail value. To enter, just fill in the Rafflecopter form below. You must be a US resident ages 18 and up. Only one entry is mandatory to enter, but bonus entries increase your chance to win. Giveaway ends at midnight on 10/15/2014. Good luck! 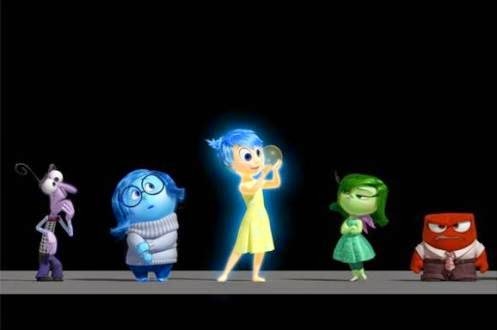 I can't even begin to tell you how excited I am to see INSIDE OUT! This is going to be a great movie! It's so important that we teach children to recognize their emotions and I'll bet this movie makes a huge impact on many children. Take a minute to watch this teaser and I'm sure you'll agree! I have always wanted a toaster oven. It's like the grownup version of an easy-bake oven. I had an easy-bake oven as a kid and this Black & Decker Convection Toaster Oven totally trumps that 60-watt light bulb in plastic. This compact toaster oven will fit up to six standard bread slices or even a 12" pizza. It toasts, bakes, warms, and even broils! The three dials make it so easy to create amazing meals that are simple and delicious. I set the top dial to the temperature I want and the middle dial to warm, bake, broil, or toast. The bottom dial is the timer, which goes up to 60 minutes so I can make almost anything in this convection oven. Hunger set in, so it was time to try it out! I had some leftover fajita chicken in my fridge I needed to use up, so I grabbed a few pieces of rye bread and some cheese. I buttered one side of both pieces of bread and put them, buttered side down, on the baking pan that comes with the Black & Decker toaster oven. I sliced up the chicken chunks and set them on the bread, then sprinkled shredded cheese on top. I set my toaster oven to 300 degrees, turned the dial to bake, and set my timer for 10 minutes. I put the baking pan on top of the wire rack that is also included. There is also a drip pan that sits below the wire rack. The wire rack is also designed with notches so that the baking pan can slide directly under the wire rack in the oven. After ten minutes, my cheese was beautifully melted, my bread was lightly toasted, and my chicken slices were heated thoroughly. I cut a thick tomato slice from a fresh heirloom tomato and put it between the two pieces of warmed sandwich pieces, then sliced my sandwich in half. Lunch was dreamy and delicious! I can't wait to see what else I can create! Get your new Black & Decker Toaster Oven at Target! If you need an amazing holiday gift for someone special, this is it! Be sure to follow them on Facebook and Pinterest to keep up to date on new products and special promotions. Nearly everyone I know has a mobile phone. Some of my friends even have the iPhone 6 already! Buying a phone case is a very smart decision because it protects the phone, but with Casetify you can create a custom phone case that expresses who you are and what you love most. You can upload your photos and completely design a phone case in just a few simple steps. Their online program lets you choose your phone type and design layout, then they'll ship your new case to your door. Initially I was going to design one for my iPhone 4S, but when I saw their stock collection, I fell in love with this pink mosaic design. Casetify has so many ways to let our mobile phones reflect our personalities, hobbies, families, pets, sports, and more. They have cases for iPhones including the new iPhone 6, plus Galaxy, Nexus, HTC, and many others. My new iPhone case is very high quality and I love it! Go see how easy it is to design the phone case you really want at www.casetify.com! You can also follow them on Facebook, Twitter, Pinterest, and Instagram, then enter below to win a Casetify Custom Phone Case! Win a Casetify Custom Phone Case! To enter, just fill in the Rafflecopter form below. Open to US residents ages 18 and up. Only one entry is mandatory to enter, but bonus entries increase your chance to win. Giveaway ends at midnight on 10/15/2014. Good luck! Enter my other giveaways HERE! Follow ME on Facebook HERE! The holidays are coming and The Beatrix Girls are ready to rock your daughter's world! These awesome 12-inch fashion dolls are designed for ages 6-12 years. These pop star dolls feature beautiful hair and fashionable clothing right down to their shoes. Full of glamour and bling, The Beatrix Girls are a great catalyst for imaginations. Your daughter will be able to move the dolls' bendable arms and legs to strike a pose. These dolls feature bright happy faces and sweet expressions. The Beatrix Girls even have their own popstar website, full of their music and fun videos, where your daughter can learn more about Brayden, Chantal, Lark, and Ainsley. It's a wonderful way for young girls to learn more about the music industry. The Beatrix Girls have even started a blog. The Beatrix Girls are available at ToysRUs, both online and instore, and other retailers. Your daughter probably already knows a lot about these great Pop Star Fashion Dolls. Beat the holiday rush and order yours early before they sell out. Be sure to enter below to win TWO of The Beatrix Girls dolls! Enter to win TWO Beatrix Girls Pop Star Fashion Dolls! To enter, just fill in the Rafflecopter form below. Open to US residents ages 18 and up. Only one entry is mandatory to enter; bonus entries will increase your chance to win. Giveaway ends at midnight on 10/15/2014. Good luck! October is National Popcorn Month! GH Cretors Popped Corn makes lots of flavors and you may have read my previous review of their Cheese Corn, Caramel Corn, and Chicago Mix. I'm so excited to share that they now also make Organic Simply Salted and Organic Extra Virgin Olive Oil Popped Corn! I'm a huge fan of popcorn and when it's organic, that's a real bonus. GH Cretors makes their Organic Simply Salted fluffy popped corn in small batches, with three ingredients: Organic Popcorn, Organic Sunflower Oil, and Sea Salt. It's incredibly fresh and delicious. Their Organic Extra Virgin Olive Oil popped corn is also made in small batches, using Organic Popcorn, Organic Extra Virgin Olive Oil, and Sea Salt. It's just as delicious as the Simply Salted with a slightly different taste. I've worked my way through two bags already and can't decide on a favorite. Popped corn is one of those wonderful guilt-free snacks that is encouraged in most diet plans because it's filling without stacking on loads of empty calories. Our favorite time to snack on popcorn is in the evenings when we're relaxing from our day and watching a bit of tv, but it's great anytime! Visit GH Cretors at www.ghcretors.com to check out all their delicious flavors of popped corn! Follow them on Facebook, Twitter, Pinterest, and Instagram, then enter below to win a case of 12 bags of GH Cretors Organic Popped Corn (6 Simply Salted and 6 Extra Virgin Olive Oil)! Enter to win 12 Bags of GH Cretors Organic Popped Corn! To enter, just fill in the Rafflecopter form below. Open to US residents 18 and older. Only one entry is mandatory to enter, but bonus entries increase your chance to win. Giveaway ends at midnight on 10/15/2104. Good luck! I think I worry so much about the wrinkles around my eyes that I never even really considered that my forehead might be wrinkling too. Bremenn Clinical Instant Forehead Smoother is designed to help smooth forehead lines and create an immediate appearance of firmer skin. I decided to see if it really works. After cleansing my skin, as I do every morning, I squeezed out some of the Instant Forehead Smoother into my hand. It's a rich, creamy lotion that has almost no scent at all. Looking critically at the forehead lines I'd never really noticed before, I smoothed it over my forehead and waited for a miracle. Instantly, I could actually feel my forehead skin firming up! I did notice a difference in the appearance of my skin too. I'm now using it daily and I am also applying it on my neck, hoping to prevent the eventual "turkey neck" that most ladies get as they age. I love this stuff! Bremenn Clinical is available at Ulta and Kohl's. They also offer a Miracle Cream that I can't wait to try! Check out their entire line of products at www.bremennclinical.com. 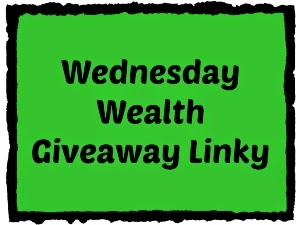 Link up your giveaways and enter to win! Disclosure: This is a Fashionista Event and a promotional item was provided to me by Sweetworks. Hosts for this event are Still Blonde after all these Years and ModlyChic. Is your home decorated for Fall yet? Have you pulled out your Halloween decorations? Here is a sweet idea for this year! SweetWorks Candy offers a huge assortment of candies that are perfect for creating displays that will delight your family and friends! Everyone loves classic Sixlets candy-coated chocolate balls and SweetWorks Candy offers both a Halloween Mix of green, black, and orange, as well as an Autumn mix of orange yellow, red, and brown. Plus you can even order single color bags of Sixlets. I love using mason jars in my home decor displays because they are versatile and made of clear glass to show off the candy colors. I also added a few candles and fall decor to my SweetWorks Candy display, but everyone agrees that the best part is the candy. I got big gumballs in the Halloween Mix of black, green and orange, as well as Spooky Eyeballs Gumballs. I haven't had a gumball in years but it's been a blast blowing big bubbles this week. The quality of SweetWorks Candy is wonderfully fresh and delicious. It's so much fun to mix and match the SweetWorks Candy in my displays and by getting an assortment of different candies, there is something for everyone. For over 50 years, they've been a leader in confections! The SweetWorks Pearls are little hard candies and I got both the Halloween Mix and the Autumn Mix. They are a tiny treat that is perfect for topping off Halloween recipes like cakes and frosted cookies, but I love to grab just a couple to melt in my mouth when I'm craving something sweet. The Ovation Break-A-Part is something I hadn't ever seen. It comes in a large round shape and when you're ready to open it to share, you press down on it and it breaks into chocolate slices! The Pumpkin Spice Break-A-Part (in an orange wrapper) and Dark Mint Spice Break-A-Part (in a green wrapper) are perfect additions to my display. Just think of all the different ways to mix and match these candies to create different kinds of displays. I can use just the Autumn Mix to create a fall centerpiece on my table for Thanksgiving. Using a variety of candy bowls, jars, or even a tall clear vase is a great way to showcase candy color combinations. Got a Halloween party coming up? The Spooky Eyes Gumballs would look eerie sitting on top of a big bowl of chocolate pudding, or use two of them to top each cupcake creation. SweetWorks Candy makes it so easy to create a Halloween or Fall display on your party table. Don't forget your trick-or-treaters! SweetWorks Candy also comes in individually wrapped packaging, so your house can be the sweetest one on the block. Those little goblins will be knocking on your door very soon and you want to be ready for them. When I was a kid, I always ate the Sixlets from my trick-or-treat candy stash first. Okay, I admit it, I also ate them first when I opened this candy shipment last week. When my husband discovered I had Sixlets in the house, he decided he needed a Sixlets display on his desk at work too. SweetWorks makes Halloween simple with their big bags of individually wrapped candy bags. The Witch's Brew bag features 100 pieces of assorted bubblegum and candy and there's even a 110-Piece Sixlets Bag that is perfect for turning spooky ghosts into happy children. Check out www.sweetworks.net to see their gigantic assortment of candy for any occasion! Their brands include Niagara Chocolates, Celebration, Ovation, Oak Leaf, Sixlets, and Nerds. The SweetWorks website also features fabulous candy buffet ideas and recipes using their candies. Follow them on Facebook, Twitter, and Pinterest for even more great ideas! Now that I have you craving some delicious SweetWorks Candy, are you ready to enter to win? 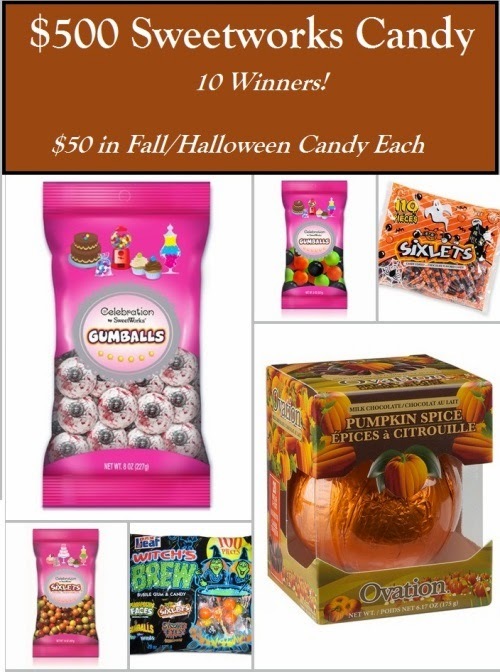 TEN lucky winners are each going to win $50 in Fall/Halloween candy! You can enter below to win and be sure to visit my fellow bloggers on the linky below to see how they are celebrating the season with their displays, recipes, and food crafts! At one hotel I stayed at for a week, the sheets were so awful that I could hardly sleep. They were old, tattered, and felt slippery when I laid down on them. I was miserable. I sleep so much better when I'm on good quality sheets and this Hemstitched Sheet Set from BrylaneHome definitely exceeds expectations. A higher thread count generally means a better sheet. Most sheet sets that you find at local discount stores are no more than 400 thread count, and many of them are 250 thread count. This Hemstitched Sheet set is 600 thread count, which makes for a very luxurious, soft sheet. Since I always wash sheets before I sleep on them the first time, I'm sometimes worried whether they will come out of the dryer ready for a perfect photo. The Hemstitched Sheet Set came out perfect. The fitted sheet is elasticized all the way around, instead of just on the corners, so it truly hugs my mattress. I chose the Mocha color from and although it looks a bit "gold" in my photos, it's only due to the color of my bedside lampshade color. The photo from the BrylaneHome website (photo at the top of this post) is actually a closer color match. It blends in perfectly with my decor and I simply love it. Color choices include mocha, ivory, butter, spice, teal, mauve, and sage. The hemstitching along the pillowcases and top sheet is beautifully done and gives the sheet set a very classic and clean look. 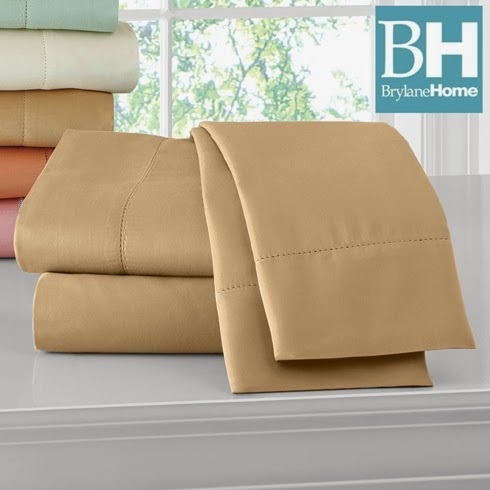 I highly recommend the BrylaneHome Hemstitched Sheet Set. I'm absolutely thrilled with mine! 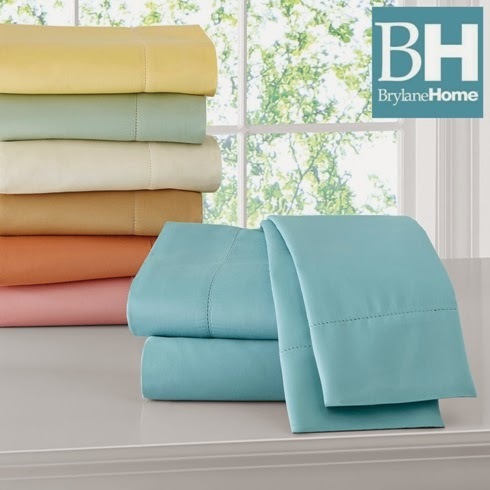 One winner will win a luxurious 600TC Hemstitched Sheet Set from BrylaneHome! Just click HERE and fill out the contest form!